The city’s lower town enclosed by a circuit wall lay entirely in the plain. A strictly geometric pattern of four wide avenues (plateiai) running north-south and fourteen east-west streets (stenopoi) divided the lower town into eight districts and 64 housing blocks. 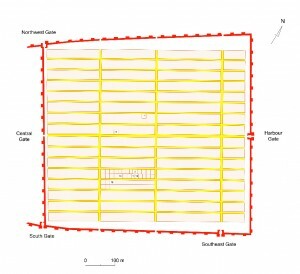 The trace of the enceinte, the gateways, the street plan and the housing blocks were all laid out to an overall plan and there is an evident relation between the street plan and the gateways. About 1,400 houses were neatly arranged in the 64 housing blocks of unequal dimensions. 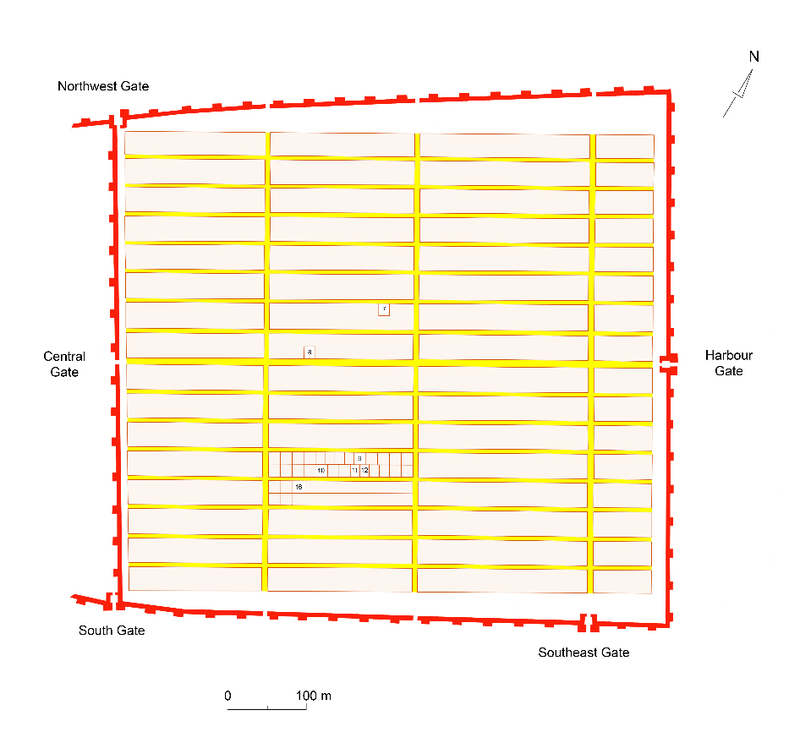 In general the blocks had a width of c. 31.5 m, but the length of the blocks varied: 76 m, 187.5 m and 230 m. Each block contained two rows of houses with a depth of c. 15 m, but the width of the excavated frontages varied between 12.50 and 17.40 m. The arrangement of rooms and courtyards also showed variation. Halos had an estimated 9,000 inhabitants. 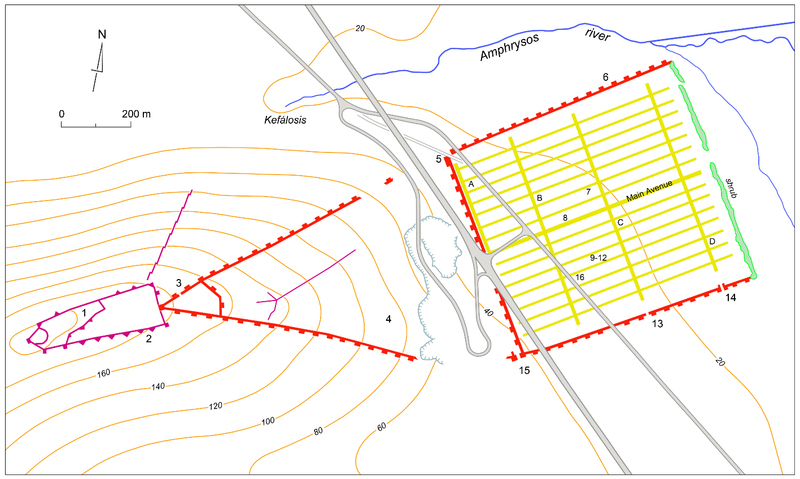 In the built-up area of the lower town of Hellenistic Halos no evidence was found of public buildings with exception of a widened portion of the Main Avenue, where the Agora may have been. The most likely location of public buildings would be the city’s upper town where foundations were brought to light in the mapping of the area above the quarry. At least remains of sixteen buildings were found on a narrow strip of ground between the walls running uphill at an altitude of 45 to 95 m above sea level. Between the West wall of the lower town and the 70 m contour line a wide strip of the limestone spur has disappeared due to recent quarrying. 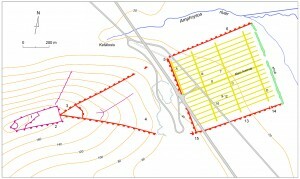 The distribution of the buildings suggest that there were originally approximately 20 to 25 buildings between the West wall and the 90 m contour line. The walls of a large building with a cistern enclose an area of 35 x 30 m. This building lies practically in line with the Main Avenue providing an excellent view on the lower town and Soúrpi bay. Another building enclosed an area of 28 x 16 m. In this building a stone with drafted edge was found and part of a floor consisting of pebbles embedded in mortar. Of only one of the small buildings were the walls entirely visible at the surface: the sanctuary dedicated to Demeter and Persephone.